SAP Solman is a SAP product used to provide a centralized, robust solution management product it is helpful to manage technical support in distributed environment. It includes various key functions like solution deployment, IT Service Management, Business and Application Operations and continuous maintenance and improvement. With SAP Solman, you can perform maximum operations with minimum cost in SAP solution environment. SAP solution manager tutorial is designed for the professionals who has a basic knowledge of SAP Product suite, SAP ECC installation, and SAP Basis. 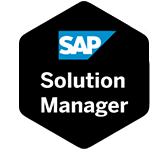 Once you complete this tutorial, you will be expertise in maintaining SAP Solution Manager effectively. Before you learn this tutorial, you must e well versed with Work Center, IT Service Management, System Administration, SAP products.